I never Tweet. Mostly because I don’t understand Twitter. I haven’t read my Dummies for Twitter book even though I’ve had it for a year. Besides, who has the time? Between writing fiction, song lyrics, the occasional poem, keeping up with e-mail, working a day job, life in general, and figuring out a new laptop, seriously I don’t have time to Tweet even if I knew what to Tweet about. My new Toshiba laptop ate my Music and Lyrics DVD. That’s what I Tweeted this morning because it’s true, weird, perhaps slightly interesting to my few followers. I even attempted the hashtag thing. This on my cell phone, but when I hit the right button to see who had Tweeted about me (no one ever does as far as I know, but I never check and Twitter just makes me feel more anonymous than I usually do) lo and behold, someone has posted a Tweet about me! Not about me, exactly, but about my short story “Katy’s Place” which appears in the anthology I NEVER THOUGHT I’D SEE YOU AGAIN. It’s a positive review. Dare I say a glowing review? If you’re not a writer you won’t get why this is such a big deal. Even as a published author I languish in obscurity. Mostly this doesn’t bother me. My novels get good reviews but what counts in the publishing world is what I don’t have a lot of: sales. There are many days when you wonder is anyone reading my work? Does anyone know it exists? Am I just spinning my wheels? I need reviews, validation, something, to keep me going. Simple acknowledgment, maybe. I’m supposed to use social media to market my work and I would…but me and technology, we don’t get along (see above description of disappearing DVD). God works in mysterious ways, doesn’t He? I rarely post on Twitter. I’ve never lost a DVD inside a laptop, either. But if I hadn’t I doubt I would have seen Nathan’s review. God must have known that was exactly what I needed. Let’s all order Nathan’s book. This story was a well-balanced story that was dark – and hopeful – in parts. The set-up is this: Cassie, a woman who as a teen lost control of her car and had an accident that claimed the life of her best friend has just come face-to-face with the friend’s mother, many years later. Is there forgiveness? Cassie isn’t sure, but when her dead friend’s mother asks for time to sit and talk to her, Cassie accepts. 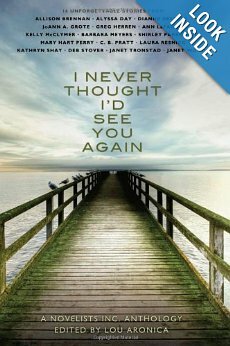 What follows is an eloquent – and at times, almost painful – recounting of Cassie’s life as she tells the mother everything she has done to try and pay back a debt she knows full well she can never repay. barbara meyers, book reviews, katy's place, nathan burgoine, short stories. Bookmark.